Garhwal Rifles has released advertisement of recruitment rally in Dehradun for the youth of Garhwal Mandal. Garhwal Rifles Regiment of Indian Army Rally will be conducted in October month between 10 October to 18 October 2015. Recruitment will be done for the General Duty, Soldier Clerk, Soldier Technical and Soldier Tradesmen. Each rally day is for youth of different districts of Garhwal Region. All interested youth can reach ‘Virpur Ground’ at Garhi Cantt Dehradun as per schedule date. Open rally for Garhwal Mandal youths will be conducted in Dehradun. Garhwal Rifles open bharti is for all youths of Garhwal region. Garhwal Rifles will conduct open rally recruitment in Dehradun district wise. Each day is schedule to attend by respective district candidates. Garhwal Rifles Regiment recruitment rally is open for all candidates of Garhwal region and any there are no application for neither online nor offline. Recruitment process is fair and clean. BEWARE ANY FALSE PERSON & FRAUDANTS. Physical standard will be as per height-weight ratio. For General Duty : Minimum height is 166 cm and weight 48 kg (except Haridwar). 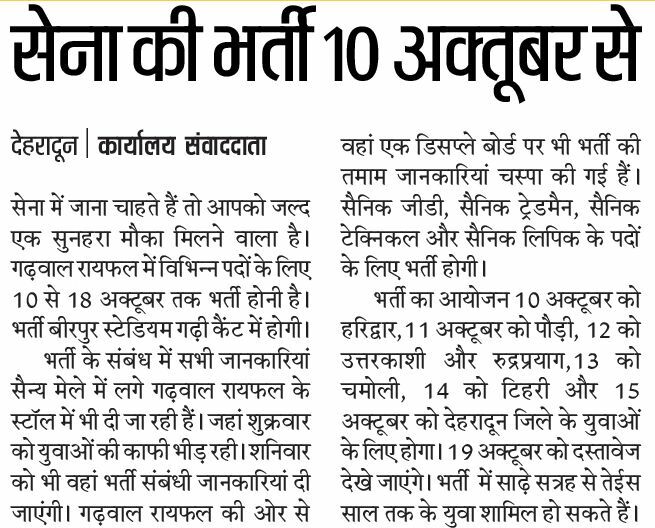 For Haridwar candidates, minimum height is 170 cm. For Soldier Technical : Minimum 163 cm. For Haridwar candidates, minimum height is 170 cm. Written examination will be of objective type and have two Papers. Written Exam tentative date is 31 Jan 2015. Questions will be from Current Affairs, General Knowledge, Mathematics & IQ. Total marks will be 100 and minimum marks to pass is 32 . For Soldier Technical Post – Question will be from Mathematics, Physics, Chemistry. For Soldier Clerk Post – Question will be from Mathematics & English. Paper will be of 50 marks and 16 marks are needed to pass through.